Located in Stoughton our state- of – art- facility is where employees get their Operator Qualifications, OSHA 10 Cards, First Aid Training & many more! From the first day of employment every new employee receives 40 hours of extensive training, covering topics such as Personal Protective Equipment (PPE), Work Hazards, Tool Safety, Fire Protection, Traffic and Pedestrian Safety, Ladder Safety, Excavation and Trenching Safety and Dig Safe Requirements. Safety trainings are held regularly with supervisors, foremen, and other team members. All of our employees receive extensive training in their field of work. Riley Brothers is very conscious of the impact on the environment all construction can have which is why we reuse & recycle whenever possible. Pictured here is a loader preparing to use Recycled Asphalt in our asphalt mix. The recycled product means that we can use fewer natural resources & prevent a waste product from being dumped at a landfill. 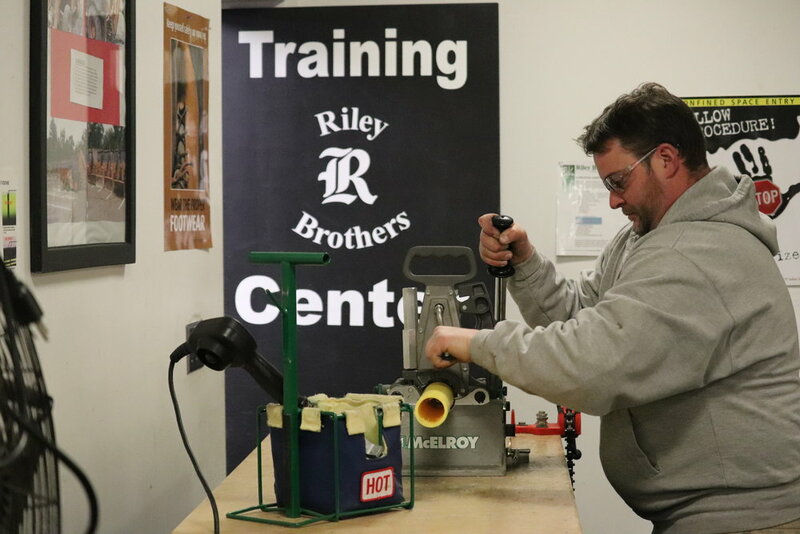 At Riley Brothers we are committed to ensuring our workforce is safe. Daily Job Safety Briefings are held each morning and throughout the day as needed on each of our job sites. Worksites are audited by our safety department to ensure compliance and every foreman has been trained to be a traffic technician by the American Traffic Safety Services Association.